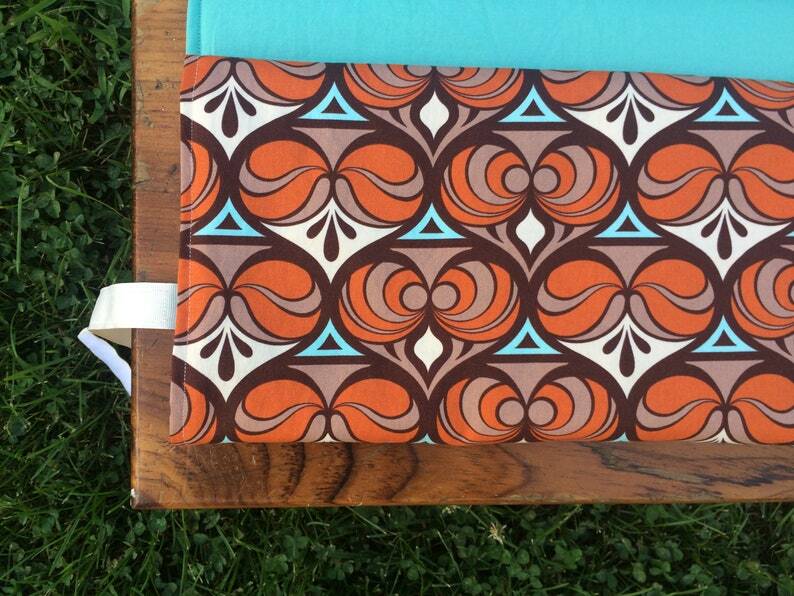 Do you love some groovy, 1970's inspired designs? Well, then this changing pad will keep you happy as you take care of your little one's business! It rolls up to the perfect size to fit into any diaper bag, and can withstand countless washes in the washing machine. You should also keep it on hand for outings to the park or to use as a lining on those germ-covered public changing tables! This changing pad measures a generous 18" x 27" (and only 4 1/2" x 7" when folded), and is lightly quilted for extra comfort. Unlike what is found in stores these days, this pad does not contain any harmful vinyl or polyurethane...only designer fabric made from 100% cotton. I used a light-weight solid blue on the inside, a heavier-weight Joel Dewberry print on the outside, and a low-loft batting in-between. The cream-colored strap has a hook-and-loop-tape closure, and the pad folds up in a way that the underside won't touch the inside, where your precious baby's bum will be! This item is ready-to-ship and will leave my shop within 1-2 days. For additional shipping information, please view my shop "policies." All fabrics are pre-washed using a dye- and fragrance-free detergent, and orders will arrive wrapped and tied in tissue paper. If this is a gift, and you would like a handmade card included with your order, just leave your card message at check-out. Machine wash cold - gentle cycle, tumble dry low. Warm iron as needed.